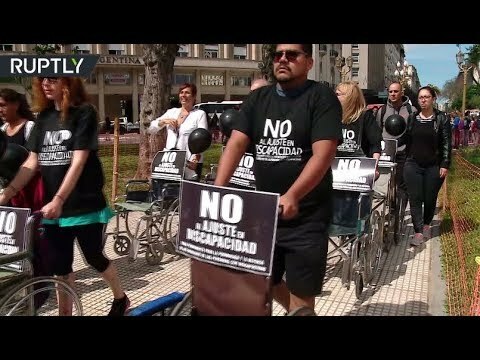 March of empty wheelchairs: Dozens protest budget cuts in Argentina | We Seek the Truth! Dozens of demonstrators took part in ‘March of empty wheelchairs’ in Buenos Aires on Wednesday, protesting against the healthcare cuts, including cuts from disability payments. The protesters were seen wearing t-shirts with the slogan ‘No to cuts in the disabled sector’ and marching with empty wheelchairs across Plaza de Mayo, where a big inflatable wheelchair was placed.